Today’s first example is not an icon. It is an icon-influenced illustration of a Russian saint, done by the noted Russian illustrator and stage designer Ivan Bilibin (1876-1942). If you know Russian fairy tales, you have likely seen the colorful Bilibin illustrations for them. And who does not enjoy a good story about Baba Yaga the witch? Bilibin has depicted him holding the “Vladimir” icon of Mary. The story of the Vladimir image — in brief — is that it was brought from Constantinople to Kiev in 1131. It was placed in a convent at Vyshgorod, today a suburb of Kiyev/Kiev. Prince Andrey Bogoliubskiy invaded and plundered Kiev in 1155. He took the icon from the convent, and was on his way back to Suzdal with it, so the story goes, when the horses stopped, and refused to go farther. Supposedly Andrey prayed all night and Mary appeared to him, telling him to take her icon to Vladimir, and to build a church and convent on the site of his vision. Then the horses were allowed to move again. Andrey did have a church and convent built on the site, and called the place Bogoliubovo — meaning loosely “Loved by God” — and from that is derived his name, Bogoliubskiy. There is something else to note in this Bilibin illustration — the white church in the background at left. It depicts a real church. In Russian it is called the Церковь Покрова на Нерли — Tserkov Pokrova na Nerli — literally, the “Church of the Protection on the Nerl” (the Nerl is a river). The Pokrov (which means literally “veil” and figuratively “protection”), you may recall, is an old icon type discussed in a previous posting. In English that church is often referred to as the “Church of the Intercession,” which blurs its real meaning somewhat. Why is it shown here with Andrey Bogoliubskiy? Because he commissioned the building of the white stone church in the year 1165 — tradition says in memory of his dead son Izyaslav — and it is still there today. Andrey Bogoliubskiy also introduced the Pokrov as a church festival in his region. Following the precedent of Constantinople, Bogoliubskiy made Mary the protectress and patron of royal authority and the State (HIS authority and HIS State, of course). In addition to the “Vladimir” image, Andrey is also associated with the Marian icon known as the Bogoliubskaya. You will recall that according to the traditional story, when taking the “Vladimir” image back to Suzdal, the horses stopped, Andrey prayed at great length, and Mary appeared to him. He is said to have had the first Bogoliubskaya image painted in commemoration of that. The Bogoliubskaya image exists in several variants. The basic type shows Mary standing full length with an open scroll in her hand, looking to the right of the image, where Christ is seen in the clouds above. The text on Mary’s scroll varies from example to example. Other examples show one or more figures kneeling before Mary at right. Generally when it is only one figure, it is Andrey Bogoliubskiy. The most interesting variant is that known as the Bogoliubskaya Moskovskaya — the “Moscow” Bogoliubskaya type. 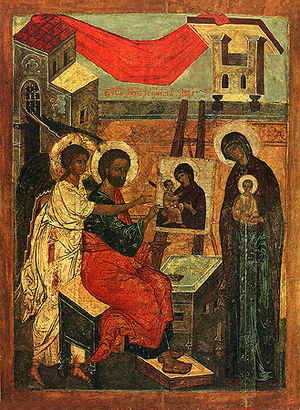 Icons of the “Moscow” Bogoliubskaya type are characterized by Mary standing at left with an opened scroll in her hand, and a group of bowing and kneeling figures at right, among them Moscow saints and other saints popular in that region. They vary somewhat from example to example, but in general one often finds The Metropolitans of Moscow Pyotr, Alexiy, Iona and Filipp; the “Fools for Christ’s sake” Vasily/Basil, Maxim, and Alexiy, Man of God; Venerable Paraskeva; Basil the Great; the Apostle Peter; the nun-martyr Evdokiya; the martyr Paraskeva, and Simeon the Kinsman of the Lord.